HSBC annual Day made fun by MotionMagix™ Interactive Floor and quizzes with MagixFone™. Brief: The company Annual Day is an occasion for employees to take a step away from the day-to-day and the mundane and HSBC gave it’s thousands of employees just that opportunity in simultaneous events spread across multiple locations. 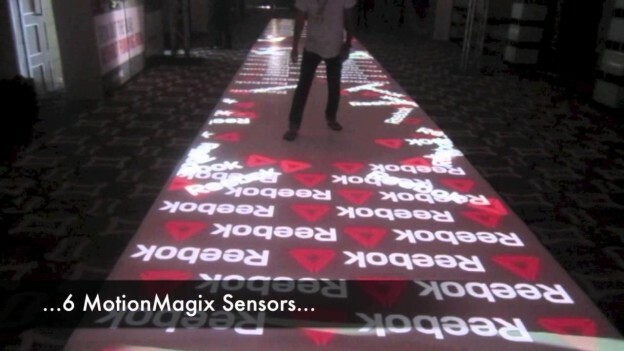 Employees visiting each location walked in over a MotionMagix™ Interactive Floor of impressive proportions. On each floor the HSBC logo was playfully interwoven with 4 different “scatter” effects that came alive as people walked across it. Given the size of each floor 3 separate projectors had to be deployed for a truly interactive experience. A key role was played by the templatized content library developed by the TouchMagix™ team. Selecting the scatter effect from the wide range of effects available in our standard selections enabled the design, installation and deployment of the entire floor across all the locations in an incredibly short time span. Completing the interactive experience was a quiz the employees participated in by using their phones using our MagixFone™ technology. Upto 10 Questions played out in rotation and the participants messaged in their responses. 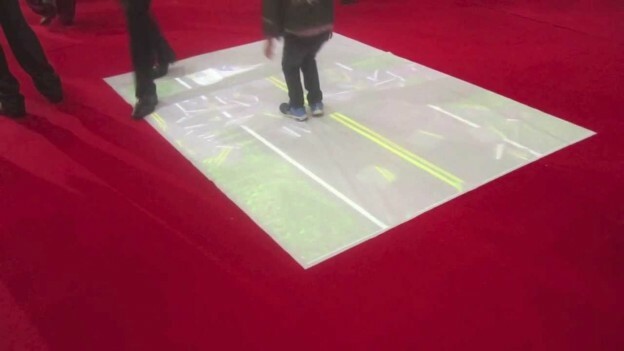 The unusual mix of interactive technologies played a key role in engaging the event visitors. 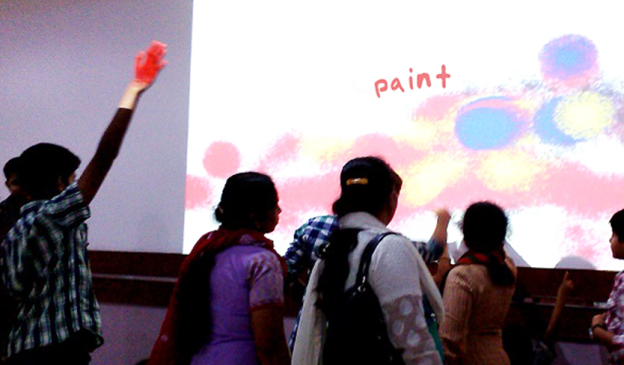 Impact: The Interactive Floors and MagixFone™ based quiz added a special interactive touch to the Annual Day event. This entry was posted in Banking, Consumer and Retail, Corporate and Industrial, Event and Media, MagixTouch and tagged Banking, HSBC, interactive floor, MagixFone, MotionMagix Interactive Floor on May 6, 2014 by Touchmagix. 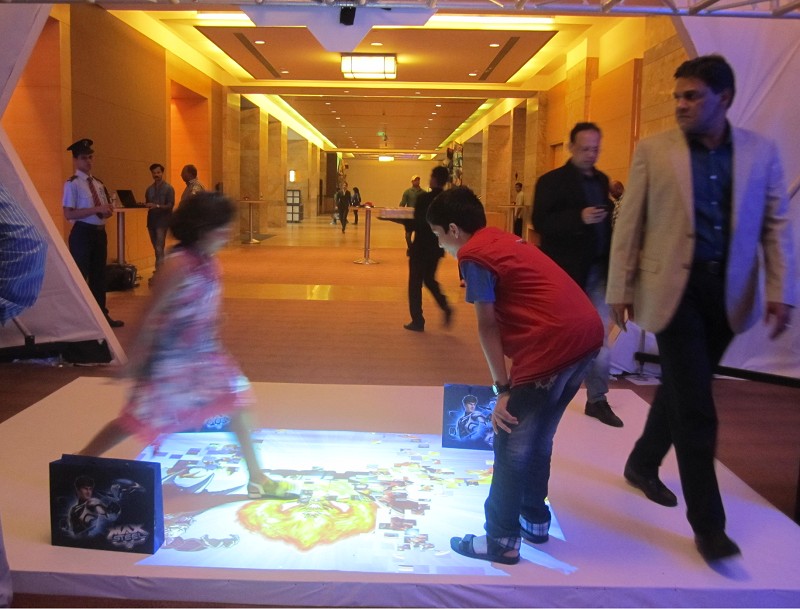 The ONGC booth featured effects on MotionMagix™ Interactive Wall and Multiple Floor games. Brief: ONGC was the organiser of Petrotech 2014, one of the largest events of the Oil & Gas Industries. Apart from being one of India’s largest companies being the organiser placed a special burden of expectation on their exhibit and ONGC chose a full complement of Interactive technologies to ensure they exceeded those expectations. The booth itself featured a MotionMagix™ Interactive Wall on an LCD screen with engaging quizzes and games to keep booth visitors entertained and engaged. The most innovative section of the exhibit featured an unusual coming together of the real and the virtual worlds. 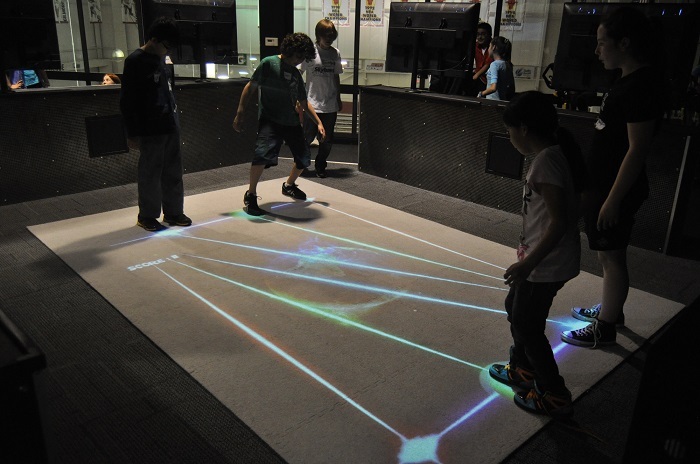 4 rectangular MotionMagix™ Interactive Floors were brought together to form a single square display. Our edge blending technology brought the display together seamlessly. The display featured a scatter effect that welcomed booth visitors as they walked in but the eye was naturally drawn towards an actual traditional lamp setting with real flowers adorning the base merging with a similar bunch of virtual flowers on the interactive display. 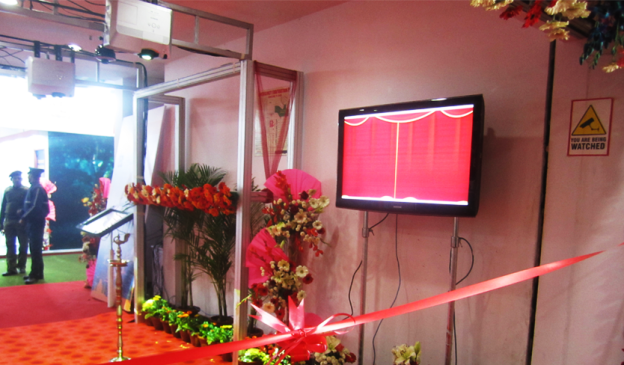 The merging of worlds didn’t end there though – the booth was inaugurated by the Union Petroleum Minister, Mr. Veerappa Moily, in a ceremony that involved not only the traditional cutting of the ribbon but a unique component on the MagixKiosk™. A symbolic opening of a virtual curtain preceded the minister signing on the interactive screen to declare the booth open – a singularly unique way to bring the magic of Interactivity to blending on-screen content to the real world. Impact: The mix of approaches was hugely popular as is evidenced by the Best Theme Based Display Award won by ONGC. This entry was posted in Corporate and Industrial, Event, Event and Media, Petroleum and tagged interactive floor, interactive wall, MagixKiosk, MotionMagix Interactive Floor, MotionMagix Interactive Wall, Multi-touch MagixKiosk, Oil & Natural Gas Commission, ONGC on February 11, 2014 by Touchmagix. A hotel lobby can be an interesting place maybe an interactive place? 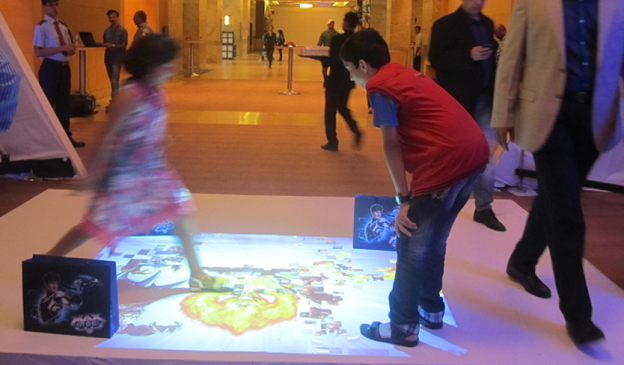 The interactive floor livened up the lobby and visitors enjoyed the different experience. Brief: Let’s face it – a hotel lobby is not the most interesting place in the world. For a hotel guest or a visitor it is often just a place to pass through while going about their business but it is also the one place that every single visitor passes through. The Pullman Hotel in Dubai saw this as an opportunity to reinforce the brand and to stand out. The objective was to use the lobby space creatively to add an element of visual appeal different from that usual experience their visitors would have been accustomed to. 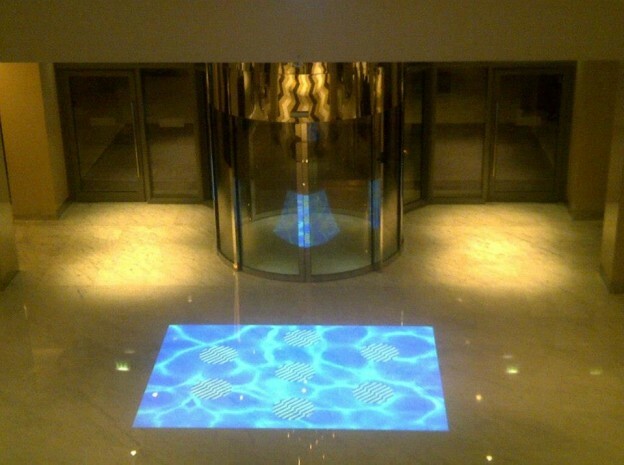 A MotionMagix™ Interactive Floor was deployed close to the main entrance with a ripple effect and the Pullman logo reacting to the footsteps of visitors. The net impact expected was that visitors would notice the distinctly different lobby and associate the different and fun approach with the brand. 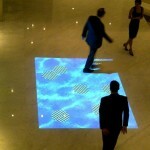 Impact: The interactive floor livened up the lobby and visitors were seen interacting with the content and retracing their footsteps to enjoy the different experience. 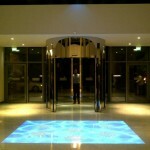 This entry was posted in Consumer and Retail, Hospitality, Hotels and Bars, Restaurants and tagged Dubai, Hotel Pullman, interactive floor, MotionMagix Interactive Floor on January 23, 2014 by Touchmagix. 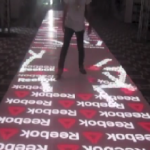 An uncompromisingly high quality display in tune with Reebok’s brand image was deployed to great effect. Objective: To provide a dazzling backdrop to a brand event within an extremely short time. Brief: Reebok is among the best known fitness brands in the world with appeal across several segments of the market and a premium focus. The brand went through an overhaul and the launch event had to represent those values so they turned to the MotionMagix™ Interactive Floor to give the event the backdrop it deserved. The only problem was the lack of time to put the installation together. This was further complicated by the sheer scale – a 60 feet long walkway in a high end hotel. The fact that the event turned out as successful as it did was down to the advanced technology that we were able to bring to the occasion. The Edge blending capability of our solution allowed a smooth installation despite the extreme length. As a matter of fact the multiple sensors connected over a network present such flexibility that displays of virtually any size can be deployed in a very short time given extremely robust, content development and support teams, like our very own. 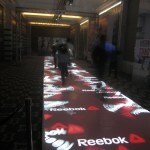 The Reebok event turned into a dual showcase – the brand as well as the technology and the extremely speedy deployment! Impact: An uncompromisingly high quality display in tune with Reebok’s brand image was deployed in the time available due to the capability of the advance technology. This entry was posted in Consumer and Retail, Consumer Brands, Consumer Goods, Corporate and Industrial, Event, Event and Media and tagged interactive floor, MotionMagix Interactive Floor, Reebok on January 21, 2014 by Touchmagix. Dealer conference became more interesting and enjoyable experience for the participants. 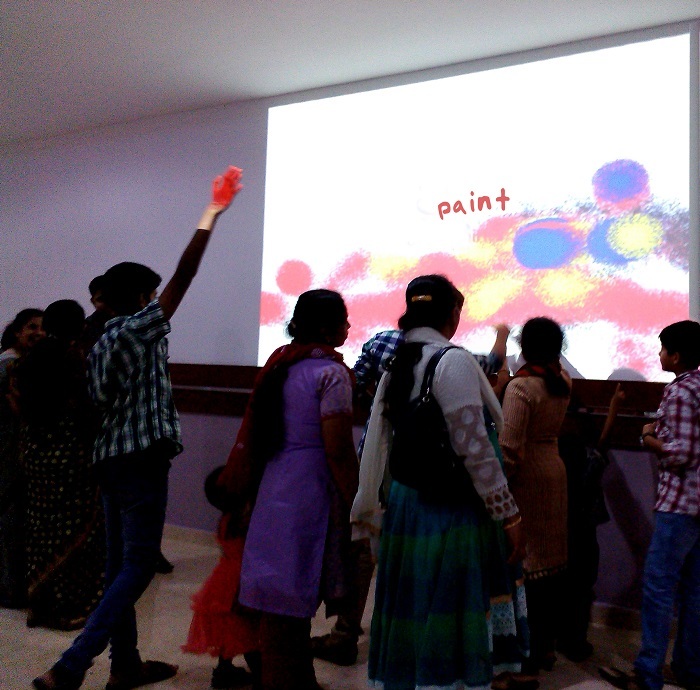 This entry was posted in Consumer and Retail, Corporate and Industrial, Event, Event and Media, Manufacturing and tagged Manufacturing, MotionMagix Interactive Floor, MotionMagix Interactive Wall on August 28, 2013 by Touchmagix. The “bowling like never before” promise that Smaaash makes to its patrons is reinforced by the dazzling interactive experience at the bowling alley. Objective: To elevate the bowling alley experience above the commonplace with a unique blend of the real and the virtual. Brief: Smaaash sees itself as a “first of its kind interactive experience” and as a pioneer of sports simulation technology. Each element of the experience is replete with unique touches intended to drive home this message. 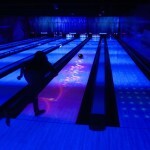 The Bowling Alley is among the most memorable of these with a unique Twilight Bowling experience under UV light. 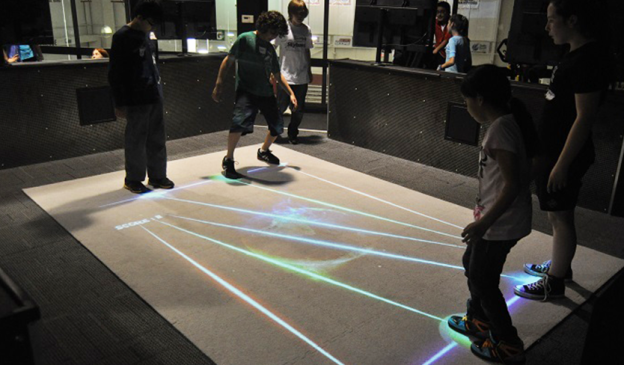 Adding to the attraction of the alley is the smaaashing MotionMagixTM Interactive Floor that lights up with spectacular visual effects as the players rack up points from frame to frame. Previously in bowling alleys the area to be covered with projections presented a special challenge but a recent upgrade in the software allowed us to achieve spectacular results with roughly half the number of sensors and projectors for twice the previously covered area. 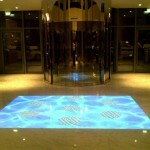 Installations are much faster and more cost effective now – this kind of interactivity may well become the norm. Get set for lanes of fire and blazing bowling. 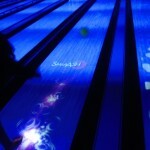 Impact: The “bowling like never before” promise that Smaaash makes to its patrons is reinforced by the dazzling interactive experience of the bowling alley. 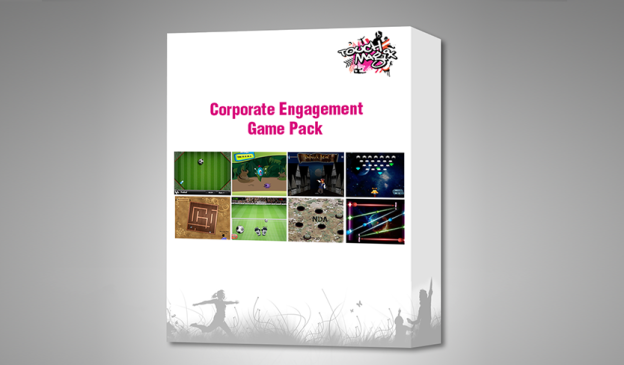 This entry was posted in Consumer and Retail, Education and Kids, Entertainment, Event and Media, Sports and tagged Bowling Alley, Gaming and Entertainment, Interactive Bowling Alley, MotionMagix Interactive Floor, Smaaash Mumbai on August 18, 2013 by Touchmagix. 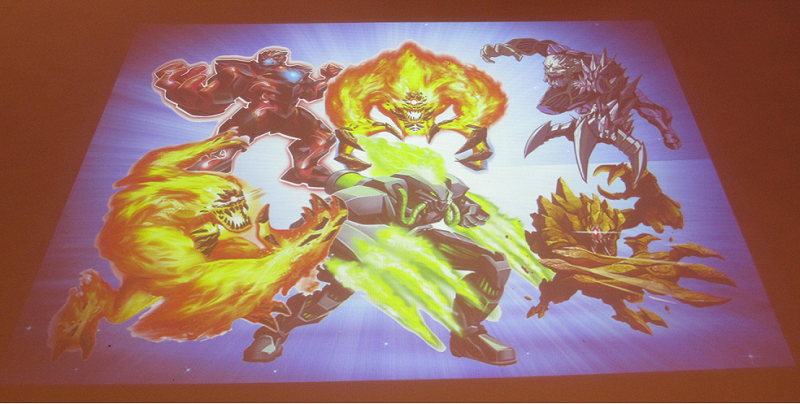 Mattel Toys used a highly appreciated futuristic theme and similarly futuristic ambiance at the launch venue. Objective: To create an ambiance in line with the futuristic premise of the brand being launched. Brief: India is now ready to face down the might of the super villains from across the galaxy with the advent of Maxwell McGrath and his alien partner Steel to our shores. 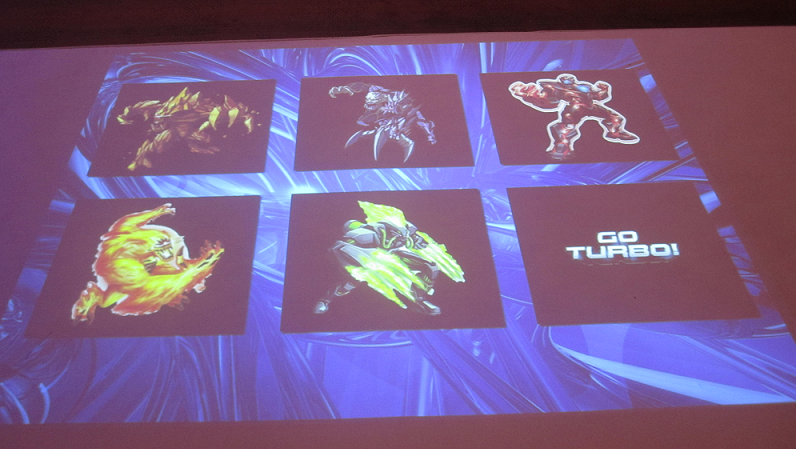 Mattel unleashed the TURBO energy of their blockbuster worldwide property the teenage superhero Max Steel in a grand event at a luxury hotel in Mumbai to great fanfare. 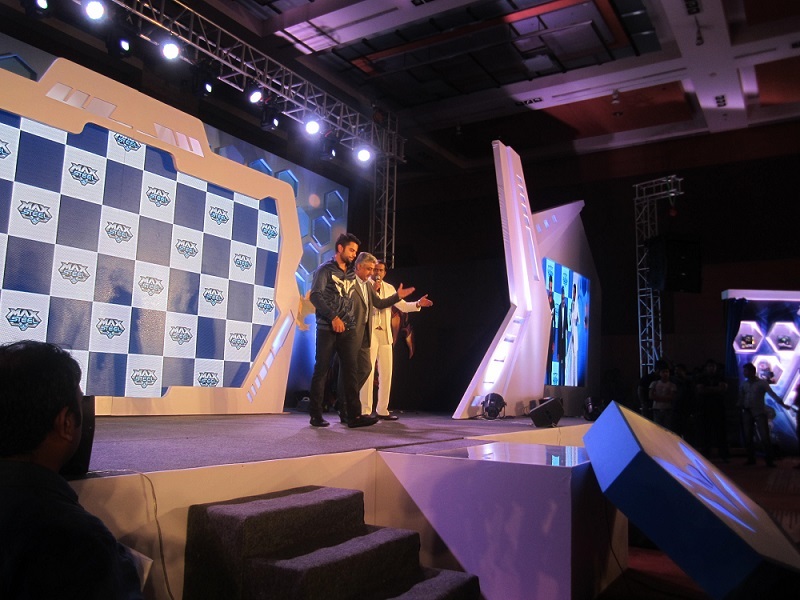 Another youth icon with a cult following,Virat Kohli, was the guest of honour at the event and he launched the range of Max Steel toys, a music video and an animated series as he showed off his best super villain busting moves to an appreciative young audience. 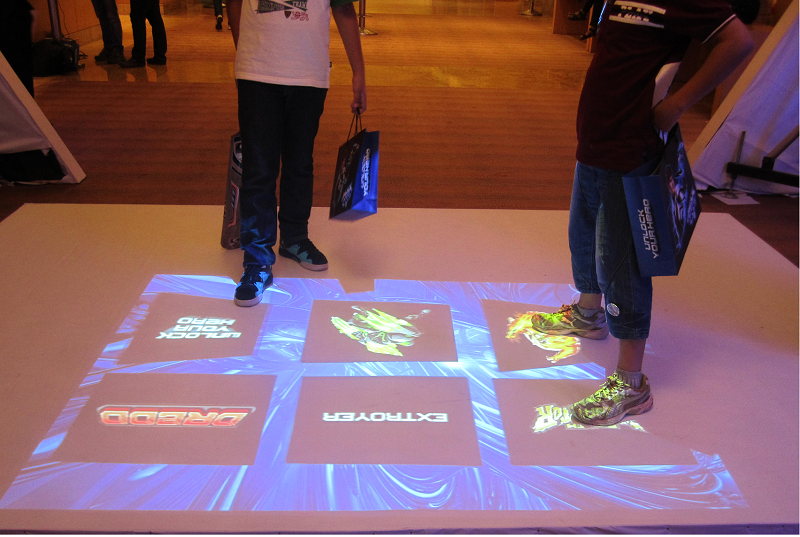 The event was also made memorable by a MotionMagix Interactive Floor that was deployed at the venue. Kids big and small hopped, skipped and jumped in their own Max Steel inspired fashion to interact with the heroes, villains and other characters that appeared on the floor – you could say they jumped with both feet into the story of their new favourite teen sensation. Impact: A futuristic theme needed a similarly futuristic ambiance at the launch venue and this was amply achieved. This entry was posted in Consumer and Retail, Event and Media, Kids, Media and Entertainment and tagged interactive floor, Interactive Floor System, Kids, Mattel Toys, Max Steel, Media and Entertainment, MotionMagix Interactive Floor on July 24, 2013 by Touchmagix. The Bulls Sox academy’s mission is to create a fun, safe and invigorating environment. TouchMagix made sure. Brief: The Bulls / Sox academy is a leading youth player development program with the imposing heritage of 2 iconic sports teams backing it. Among the most popular facilities is The Vault where fitness meets gaming. 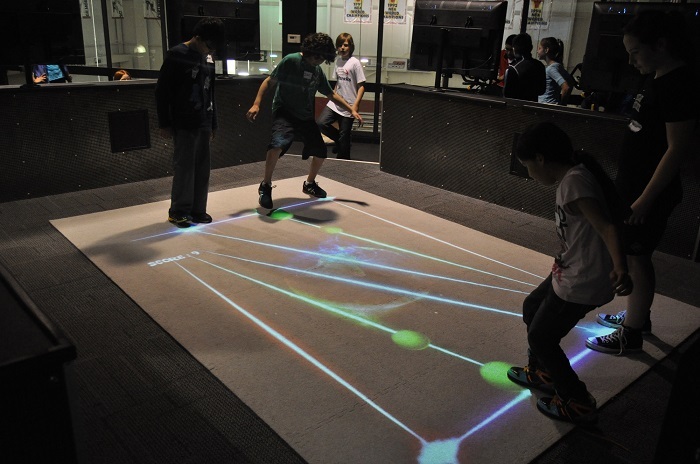 The facility boasts a variety of exercise – game combinations including an Interactive Floor that occupies pride of place. 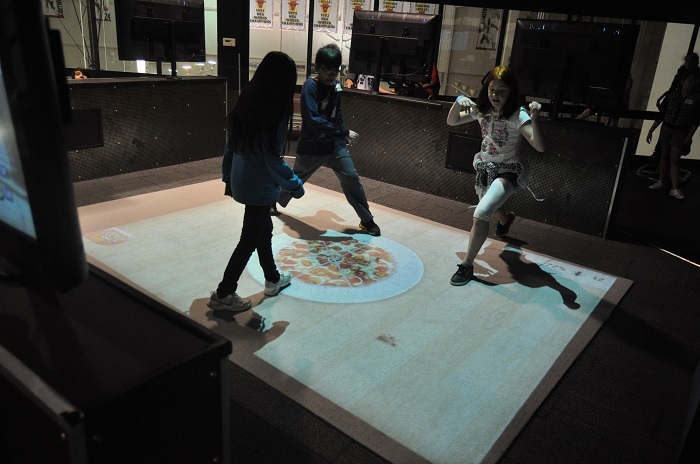 The floor has eye-catching visuals and invites kids to practice their moves on the floor in a game kind of environment while interacting with the floor as well as other kids. In a day and age where parents and teachers alike are struggling with the challenges posed to them by the need to keep their children entertained, exercised and educated here in The Vault the kids get active while having a great time. The Interactive Experience goes beyond just the interface with a computing device & extends to the way an activity is performed – an opportunity to be immersed and participate in an Interactive experience for the kids to learn from, play with and enjoy. Impact: The Bulls Sox academy’s mission is to create a fun, safe and invigorating environment to nurture the athletic ambitions of the youth and the Interactive Floor fits right into that mission. This entry was posted in Education and Kids, Entertainment, Event and Media, Sports and tagged Bulls / Sox academy, Chicago Bulls Sox Academy, Entertainment, interactive floor, MotionMagix Interactive Floor, Sports, touchmagix, Youth Player Development Program on June 1, 2013 by Touchmagix.